Nottingham – Amanda’s solo adventure. We have been having some communication and organisational issues with our friend Matt who was organising a car for us so yesterday I decided to go to Nottingham. Andrew was going to Manchester for two days for work so he offered to drop me in Nottingham as it was sort of on the way. 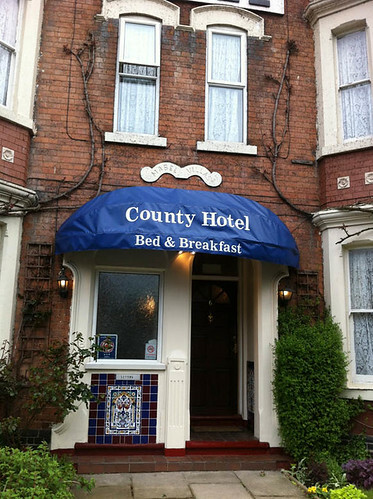 I booked myself a room at the County Hotel around the corner from Matt’s and then we set off. Cambridge’s sunshine quickly turned to clouds and then rain the closer we got to Nottingham – and on my way back I emerged from rain into sun when Cambridge came near, reinforcing my idea of Cambridge having the best weather in the UK. Which it clearly does. I tried to book into the hotel – which was more like a B&B – but no one answered the door. So I went to a nearby pub and had a hot chocolate and used their wireless to finish the previous blog entry. At 4 I went back and checked in and then Matt called to say he’d come past at 6ish. He eventually came by at almost 7 (waiting is my favourite). We headed straight to Doncaster, an hour away, to pick up the van. That went pretty smoothly, although the previous owner had left just enough fuel to get to the nearest petrol station. Thanks a bunch, jerk. 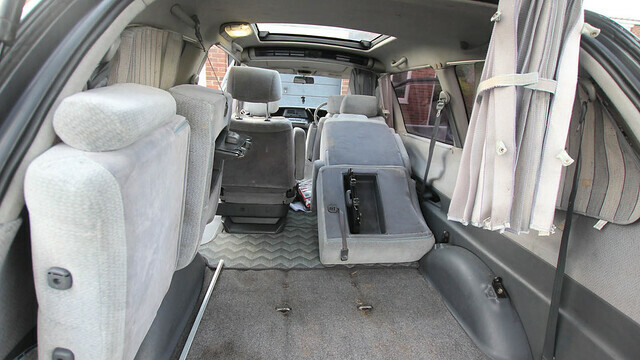 That, the smell, the pet hair and the fact that not one square centimetre of the upholstery was unstained, left me wondering wtf was wrong with the guy. I swore to myself I’d get it detailed at the earliest possible moment. Possibly twice. So we stopped to have a drink at the nearest petrol station/coffee place and sat for about an hour while Matt tried to sort out insurance over the phone. I’d left my licence at the hotel (you can drive here without having it on you… not that I’d thought about that at the time) so we couldn’t sign it up in my name and Matt hadn’t brought a credit card and mine weren’t accepted by the system… yet more frustration. In the end we decided to risk it and head back to Nottingham. I drove the van. It wasn’t too bad. The steering is somewhat loose but I can cope with that. The main issue is that it was raining and the wipers made this high pitched noise like a family of dying mice. By the time we got back to Nottingham I just wanted to fall into bed. Which I did. A big, soft, fluffy bed that I had in a room by myself. Possibly the best part of the trip. 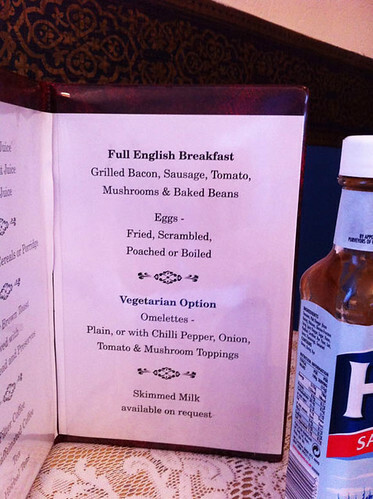 Second best part of the trip was the English breakfast. I drove to Asda the next morning and bought a SatNav, as GPS units are called here, plus a bottle of Febreeze-equivalent for the stench and some other car cleaning gear. Back to the hotel to pack up my stuff then I hit the road. Only one major issue occurred on the way home because I hadn’t updated the SatNav (although I’m not sure I could’ve, given the trouble Luke is currently having with it). I came to a freeway that wasn’t on the map. I couldn’t understand what the computer was trying to tell me, I didn’t know which direction to turn in and I went the wrong way several times, driving up and down the same stretch of highway repeatedly. I was in tears of frustration. After all the issues we’ve had in the last week I was having trouble coping with being lost and alone in a totally unfamiliar place. Eventually I pulled over to have a think, turned off the SatNav, got out my phone and took some back roads to cut across country to the highway I wanted. Along the way I drove through some amazingly beautiful countryside which cheered me up and as I was going along I thought that if I saw a pheasant I’d take it as a sign that I wasn’t going to make any more wrong turns (I have to play games like this to stop myself from going crazy… the games aren’t crazy, right?) and then I saw one! Closer than I’ve ever seen one before and it was beautiful. Turns out I didn’t make any more wrong turns and the sun came out and I got back safe and sound. Thanks pheasant! We took the van to Tesco’s for detailing. They looked kinda sad when we came back to pick it up because they didn’t think it looked much better. But it did… sort of. Then we went to get car seat covers and a socket set and we peeled off the horrible sticker someone had stuck over the back window. Airing it out. Probably won’t help but you gotta try. It doesn’t look great, but no doubt it will grow on us and we’ve done our best tidying it up. Everything is kinda broken. Le sigh. 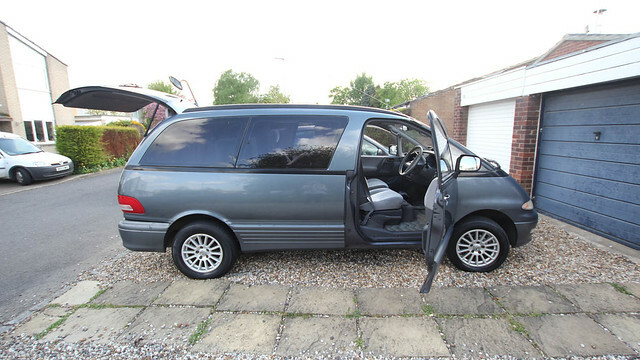 For those who are interest Matt said it cost around 800-and-something pounds and it’s a 1996 model Toyota Lucida. Because it is imported just replacing the windscreen wipers is going to cost about a gajillion dollars. We’ve decided to call it Van Failen. Oh noes!! When we drove to Nottingham from Edinburgh via Manchester, Google maps on my phone worked just fine 😀 still having trouble with the Satnav? Love the name Van Falen. Luke can’t seem to update it but we’ve got our phones and a new map book. Hopefully the van will turn out to be miss-named;). 1) She is desperate to see you. 2) She has a sewing machine and loves using it/it being used. 3) Wolverhampton has HEAPS of cheap fabric places. Thus, you will be able to turn Van Failen into Van Winning! It doesn’t look too bad! It’s just.. grotty. It’s growing on me though:). Not literally, thank goodness. I totally understand your tears of frustration – my GPS is a attempted murderer.